“The history of the country between 1803 and 1812 is the story of attempts to keep both peace and dignity,” noted one historian, and it rings true. America continued to be dominated by events in Europe. Historian Thomas A. Bailey coined the phrase, “Europe's distresses spelled Americas successes,” but it also worked the other way. America got whipped about by European turmoil, even while profiting from wars as a trading neutral. As has been suggested elsewhere in these pages, the United States was very fortunate that the French Revolution did not start earlier than it did, or, looking at it another way, it is fortunate that the Constitution was written and the government underway before the French Revolution got going. As it was, the events of the French Revolution dominated world affairs and to a great extent American domestic politics from the outbreak of the Napoleonic wars in 1792 to the defeat of Napoleon at Waterloo in 1815. The full story of the French Revolution and Empire will not be told here, but suffice it to say that the American Revolution stirred passions far beyond the Anglo-American realm, and for a time the French Revolution was seen as a successor event of the American Revolution. But the two revolutions were very different. The American Patriots never claimed that George III did not have the right to rule; they merely argued that he did not have the right to rule them. By stark contrast, King Louis XIV and his wife, Marie Antoinette, were executed, and instead of leading to the creation of a democratic republic, the French Revolution produced the rule of the Emperor Napoleon I.
Napoleon Bonaparte was one of the most skillful and successful military commanders in the history of the world. His French armies overran most of Europe and penetrated deep into Russia before succumbing to the Russian army and the Russian winter. But all of central and southern Europe were dominated by Napoleon during the first decade of the 1800s as the French army rolled over everything in its path. While the French possessed a powerful navy, they were challenged at sea by the traditional naval might of the British Empire. The conflict between Napoleon and the British became characterized as a struggle between the tiger and the shark. The royal Navy, led during this period by Lord Horatio Nelson, was well-nigh invincible on the seas. 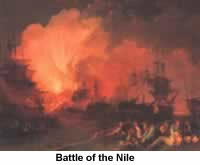 In the three great battles of Trafalgar, Copenhagen, and the Nile, Nelson crushed the Danish and French fleets and controlled the Atlantic and Mediterranean for most of the time when Napoleon was in power. The United States as a neutral nation and sought to contain a new its trade and commerce with the rest of the world even as the warring nations began to place restrictions on neutral traffic. French and British sea captains preyed upon American shipping, and although both were viewed in essentially the same light by the American government, the fact that Great Britain dominated the seas made her depredations more troublesome than those of the French. Furthermore, since the British depended so heavily upon sea power for their survival, they faced constant pressure to keep fleets well manned, a difficult task because life in the Royal Navy and was known to be harsh and demanding, and British sailors were prone to desert their ships. American merchants, always looking for experienced sailors for their crews, not only welcomed but often encouraged British sailors to desert to the American Navy. The result was that the press gangs that forced reluctant young men into the Navy with impunity, began to point the finger at deserted British sailors serving in American vessels. Royal Navy cruisers began stopping American ships and “impressing” sailors identified as deserters back into His Majesty’s service. The fact that some of those sailors might have become American citizens, or in fact had not actually deserted, made little difference to the impressing gangs. Times were desperate, and desperate measures were called for. Despite American protests, the British operated at will on the seas, and hundreds of American seamen were impressed. The “impressment controversy”continued more or less unabated until 1807, when the British went to far. The captain of H.M.S. Leopard, prowling off the American coast, after exchanging apparently respectful signals with the American warship U.S.S. Chesapeake, demanded the right to come aboard and search for deserters. When the American Captain Barron refused, the British opened fire, killing three Americans and wounding eighteen. Americans were outraged, but President Jefferson was unwilling to go to war over the issue and demanded an apology and reparations, which the British duly offered. In order to avert further confrontations, President Jefferson then ordered Congress to put an end to all foreign trade with the 1807 Embargo Act, which backfired. Despite the fact that during the ongoing conflict merchants were being harassed by both the British and French, the wartime situation had driven prices of goods up to such an extent that merchants could make a tidy profit even if some of their ships were captured. Thus New England revolted against the embargo, calling it the “dambargo.” There the matter as Jefferson's prepared to turn the presidential office over to his hand-picked successor, Secretary of State James Madison. Napoleon resumed war against the allied nations in 1803. The created a dangerous situation, but left America free to pursue its own interests and neutral, which promised lucrative trade opportunities; there was no direct threat to American security. 1805: The Battles of Trafalgar and Austerlitz: Napoleon triumphs on land, Nelson at sea. Although pro-British (Hamilton) and pro-French (Jefferson) sentiments existed, Americans felt detached and aloof from the struggles, if not completely isolationist, until the probelms escalated during Jefferson's second term. From 1795 to 1805 friendship with Great Britain prevailed despite incidents at sea. Further, the XYZ and Genet affairs were still fresh in American memory. Jefferson “always sought a bloodless substitute for war” and preferred “peaceable coercions.” Commercial coercion could be an effective tool in international politics. America was the most important neutral, making huge profits on food, etc., through the highest volume of neutral trade for decades. Legally the goods had to be really imported before being reshipped, but that was hard to prove or establish. American traders took advantage of all legal loopholes, and then some. Under the British Rule of 1756 ports not open in peacetime were not open in war, and peacetime rules still applied. U.S. merchant captains used the principle of the broken voyage—to take advantage of loophole they brought goods from British and French colonies to the U.S., then reshipped them as U.S. goods. In 1800 the U.S.S. Polly brings Cuban sugar to Massachusetts, then ships to Spain. In 1805 under the Essex ruling the mere payment of import duties did not constitute evidence of good faith importation. The British demanded more proof needed that the goods were in fact imported-if the ship put into port in the U.S., it had to demonstrate that it was not continuous voyage. Hard to prove a negative. In 1806 Non-importation of certain goods was adopted. England proclaimed a blockade from the Elbe River to Brest. Jefferson sent James Monroe to join Pinckney to try to work out a new treaty to replace Jay's Treaty. Jefferson vetoed the treaty because there was no impressment clause, although it did include concessions on broken voyages. British ships hovered off the American coast, captured and sent violating merchantmen Nova Scotia. Many were seized after the Essex ruling. The game got rougher as H.M.S. Leander “accidentally” hit a U.S. ship, killed first mate John Pierce, whose body was paraded around New York City to a great hue and cry. There were no volunteers in the Royal Navy. Food, pay, and quarters were (often literally) lousy; discipline harsh. Press gangs were employed to get sailors from the slums of British cities. This tactic had been in use for over 400 years to keep up manning levels in the Royal Navy. Impressment was seen by Americans as a violation of their neutral rights; the British promised not to take American citizens, but their idea of citizenship was not the same as ours: "Once an Englishman, always an Englishman" was their motto, and that was especially true in time of war. Americans resisted, but they were not innocent in the matter-they tried to encourage desertions through enticements, phony citizenship papers for $1, etc. (Story from class: "Your Honor, I've known this man from his cradle.") They also advertised for sailors in neutral ports-promising higher wages & better treatment. Twelve British ships were stuck in Norfolk at one point due to desertions-there were 42,000 total in the Royal Navy by 1801. British deserters were plentiful enough to make up for American losses via impressment. But Americans were building 70,000 tons of shipping each year and needed 4,200 sailors per year until 1808 to man merchant vessels.. The British violated even their own rules when they got desperate. Around 8,000 bona fide U.S. Citizens were taken by force, which hurt shipping interests, families, etc. The Americans protested, and some releases were gained, but it took time. The U.S. claimed that the American flag created de facto American territory and called British practices "nautical slavery." H.M.S. Leopard fires broadside, killing 3, wounding 18. 4 American seamen taken, 1 deserter hanged. Public uproar, outrage. British acknowledge error. Ten days after incident Jefferson closes all American ports to Royal Navy. Congress authorizes 263 gunboats. Jefferson begins somewhat reasonable military preparations. Jefferson resist war impulse, asks for Embargo against all trade by American ships overseas; enacted December 22. Tough law-loopholes plugged, hard to avoid. Yet "every conceivable variety of fraud" used to get around. Napoleon helped by capturing American "pirates." Overseas trade out, coastal trade OK if bonded. Federalists: Cutting off your head to stop a nosebleed. Dambargo, OGRABME. Outraged letters to Jefferson. Devastating economic impact in New England. Illegal trade flourished, much went through Canada; profit could be made on one shipment in three. Lasts from 12/07 to 03/09. Be it enacted, by the Senate and House of Representatives of the United States of America in Congress assembled, that an embargo be, and hereby is laid on all ships and vessels in the ports and places within the limits or jurisdiction of the United States, cleared or not cleared, bound to any foreign port or place; and that no clearance be furnished to any ship or vessel bound to such foreign port or place, except vessels under the immediate direction of the President of the United States; and that the President be authorized to give such instructions to the officers of the revenue, and of the navy and revenue cutters of the United States, as shall appear best adapted for carrying the same into full effect; provided, that nothing herein contained shall be construed to prevent the departure of any foreign ship or vessel, either in ballast or with the goods, wares, and merchandise on board of such foreign ship or vessel. . . . Section 2. And be it further enacted, that during the continuance of this act, no registered or sea letter vessel, having on board goods, wares, and merchandise, shall be allowed to depart from one port of the United States to any other within the same, unless the master, owner, consignee, or factor of such vessel shall first give bond, with one or more sureties to the collector of the district from which she is bound to depart, in a sum of double the value of the vessel and cargo, that the said goods, wares, or merchandise shall be relanded in some port of the United States, dangers of the seas excepted, which bond, and also a certificate from the collector where the same may be relanded, shall by the collector respectively be transmitted to the secretary of the treasury. All armed vessels possessing public commissions from any foreign power are not to be considered as liable to the embargo laid by this act. New York-Canadian border in a state of insurrection. Jefferson overestimated the patience of his fellow Americans. Talk of secession in New England. Embargo also caused much antagonism in England-textile workers hurt, but had no clout. Seen as helping France. Napoleon encouraged the embargo, seized American ships and claimed to be Helping America; "They must be British ships if they are on the seas." In 1809 Congress rebels and repeals the embargo. It had some good results; drove capital and labor into manufacturing, relieved impressment, bought time. Orders in Council eventually repealed. The end of Jefferson's two terms left the country much larger because of the Louisiana Purchase, but in other respects scarcely better off than in 1800. True, the Republican victory in 1800 had the effect of diffusing some of the political antagonism that characterized the 1790s, but Jefferson proved that he could be just as partisan as his predecessor Adams had been, despite the lofty words of his first inaugural address. Jefferson did not want to be remembered on his gravestone for anything he accomplished during his eight years in the White House, and that is probably an accurate judgment. Jefferson is on Mt. Rushmore, and no doubt deserves to be, but more for his thinking and intellectual leadership than for his governance. In any case he passed a healthy if somewhat impotent nation along to his successor, his friend James Madison.